Netflix is taking something of a Bill Clinton-esque approach to its first pot comedy, Disjointed. Reviewers can’t inhale anything close to the entire first season due to the streaming giant’s unusual rollout of only Episodes 1, 3, 8 and 9 before all 20 half-hours of Season One are dealt to the public at large on Friday, Aug. 25th. “We are only sharing select episodes at this time,” a Netflix publicist confirmed. Not that any TV critic, even in a highly altered state, would be game to endure the whole thing before rendering a verdict on this wobbly vehicle for the estimable Kathy Bates. She’s taking a break from the next cycle of FX’s American Horror Story to play the longtime proprietor of a Los Angeles medical marijuana dispensary called Ruth’s Alternative Caring. This is Bates’ inaugural starring role in a laugh track-spiked, studio audience-incubated sitcom, which aren’t all that uncommon on Netflix anymore. Revivals of One Day At A Time and Full House (as Fuller House) are likewise equipped, as is Ashton Kutcher’s The Ranch. And it’s the only form that co-executive producer Chuck Lorre has ever known -- at least until CBS’ Young Sheldon, a spinoff of Lorre’s The Big Bang Theory, arrives as an un-juiced “single-cam” comedy this fall. Lorre otherwise has deployed his old pal and multi-cam master James Burrows to direct the pilot episode of Disjointed. Burrows arguably could squeeze a guffaw out of George Will. But alas, he also is A-OK with dated audience whooping and applauding when Bates is first glimpsed as Ruth Whitefeather Feldman. Her hair is long and scraggly, and her outfits remain ‘60s earth motherly. Ruth also is a prototypically rigid mom at odds with entrepreneurial son, Travis (Aaron Moten). “You’re not old and out of touch. You’re just old and mean,” he tells her in Episode 3. Travis sees the state’s impending legalization of marijuana as a great way to expand the family business beyond pharmaceutical grass and “heal-ping,” as she puts it. Absolutely, positively not, Ruth retorts. Which of course means she’ll gradually relent, with remedial hugs generating audience “awwwws.” Gag. Ruth’s ex-husband and Travis’ father is a so far unseen former member of the Black Panther Party. This makes for a diverse cast of store employees. Jenny (Elizabeth Ho) describes herself as “your tokin’ Asian” while Carter (Tone Bell) is an African-American security guard struggling to recover from three tours in Iraq. Add Pete (Dougie Baldwin) as a blissed-out white kid in charge of perfecting new strains of marijuana and Olivia (Elizabeth Alderfer) as a comparatively grounded Anglo woman with designs on Travis. Disjointed occasionally throws off its sitcom-y shackles with some imaginative animation sequences and out-of-body musical interludes. Mostly less effective is a series of pop-up commercials for other marijuana companies. In the first episode, Coors beer voice-over spokesman Sam Elliott (who’s also a regular on The Ranch) narrates a forced spot for “Kush, the Banquet Weed.” And in Episode 3, a spot featuring a dancing grass container and pack of matches prompts an on-camera spokesman to add, “Gee, I’d like to f**k those two.” WTF?! 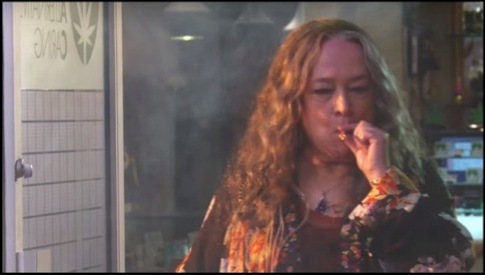 Disjointed also is clearly intent on making breakout characters of the recurring Dank and Dabby (Chris Redd, Betsy Sodaro), a super-stoner duo with a youtube show where Travis cuts a sponsorship deal in return for free weed for the hosts. A webcast spotlighting the best of Dank and Dabby’s coughing fits can be convulsively funny. But the show also errs in force-feeding the pair’s utter dysfunction. Based on the limited evidence provided by Netflix, Disjointed is also discombobulated and too often dim-witted. There’s some cleverness amid its clutter. But Bates was better served as the bearded lady in American Horror Story: Freak Show. She’s out of sorts in this particular oddity, both as a nurturer and a taskmaster tossing off tart one-liners. Don’t expect much of a buzz.